Designing and building your business website has become much easier in recent years but when it comes to your overall options for doing so, the choice can be a little difficult. Search engine optimization (SEO), website customization, ease of use, and eCommerce setup and maintenance are all important factors to consider, and we’re here to help make that a little easier. Whether you’re an aspiring webmaster looking to launch your first official business website or you’re simply looking for a new way to manage and customize your existing site, the options these days can make life so much more simple. Keep reading to find out the differences, which is better and why, and how you can easily take advantage of today’s tools or turn to affordable professional solutions to make your website design dreams come to fruition. What are the Main Differences Between the Platforms? If we were to completely break down the three selections today there are numerous differences we could cover, but we want to highlight the main variations. Wix is a drag-and-drop website builder, or WYSIWYG (What You See Is What You Get) - you can literally drag and drop content that you want on the website, without ever knowing or touching a line of code. You can also choose from over 500 professional looking design templates, including many options across a broad range of industries and industry-specific tools created for restaurants, hotels, musicians, consultants, and more. While Wix does offer a free basic website builder, this selection comes with a couple of drawbacks that can make your business website seem not-so-professional. The first of these is the fact that the platform adds Wix branded advertising on both the top and bottom of your site, much like the free hosting sites of yesteryear such as Tripod and GeoCities. The other unattractive drawback to Wix is that you cannot utilize your own domain name (your .com address) and your site has an address like: username.wix.com/sitename. Additionally, the free builder does not support necessary add-ons such as Google Analytics, eCommerce, Favicons, etc. In order to get these additional features and remove the Wix advertising, you’re required to upgrade to one of the premium packages that they offer. They offer several premium packages with each one offering different bandwidth and storage limitations and they do let you choose whether to pay monthly or yearly, but if your business requires an eCommerce store the lowest price is $16.50 per month but that does not include any apps or additional features that your site may need. This website building option offers monthly plans starting at $12 and they only allow their in-house development team to create the tools for their software. As such, Squarespace has made a commitment to answer all questions within 1 hour and while the price is off-putting for some business owners, many users state that they do like the fact that all tools have been thoroughly tested and support is readily available 24 hours a day. However, if your company requires an eCommerce store, the price for Squarespace jumps more than double per month, even if you are on an annual plan. That means you can expect to pay anywhere from around $300 to almost $500 per year just for the ability to sell your products and services directly online. This pricing plan does include the first year of your domain name registration (if you don’t already own it), as well as that support mentioned above. When it comes to customizing your website, Squarespace is a bit more restrictive than WordPress as well. However, one feature that is very well-liked on this platform is the fact that is another drag and drop tool. Which means that when you insert text or drag and drop pictures, slideshows, etc into the builder, you immediately see how the website will look “live” as you’re designing and creating the website. With WordPress, you insert the desired content without seeing what it really looks like until you preview the page or publish it. Just as with WordPress, Squarespace allows you to build, customize, and manage your website without having to know how to code nor do they require any external tools in order to accomplish your goals. With Squarespace however, the drag and drop feature does afford a bit more leeway when it comes to content placement or adjusting the site layout as you can simply move those elements around as you please. With WordPress, you may have to spend some time searching for the right plugin or theme or actually modify the code yourself. While some WordPress web hosting options such as 51 Blocks offer automatic updates, many do not. Especially the free hosting options. WordPress has multiple updates throughout the year, particularly to the core programming, and these changes can be extremely important to the security of your site and if your hosting provider doesn’t provide automatic updates, this important task is totally left up to you to complete. With Squarespace however, all updates are thoroughly tested and automatically pushed to your website, leaving you free from update worries. 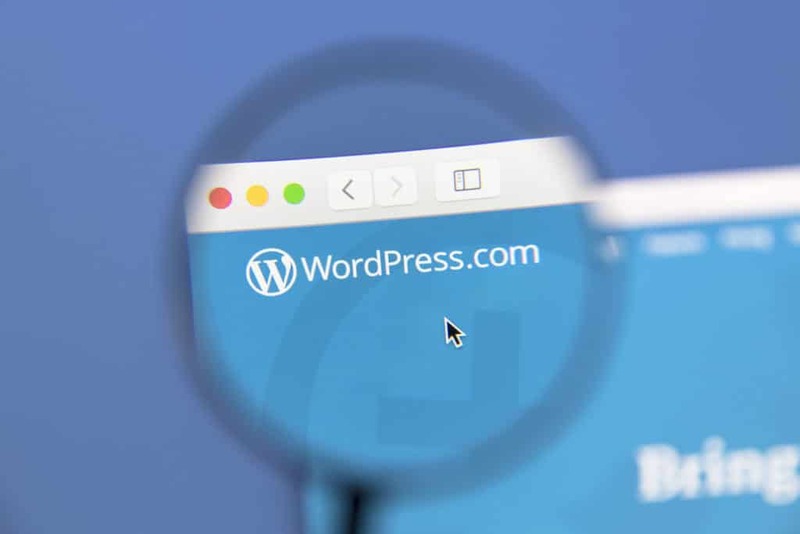 Unlike Wix and Squarespace, WordPress is an open source platform, meaning that the programming code is open for everyone to use and customize, and the WordPress software is completely free for anyone to use. While there are also some free WordPress hosting providers out there and their features are less restrictive than the barebones Wix free version, they still leave a good bit to be desired. There are thousands of free WordPress themes and plugins available and even more premium choices (there are currently over 50,000 plugins available), but one of the best features is that you can add features to your WordPress site via a plugin without having to upgrade your hosting plan. You can find themes for specific types of websites, packed with all the design elements you’re after, for everything from personal blogs and eCommerce sites to niche-specific themes like photography sites, and just about everything else in between. The same is true for plugins, there’s a tool available for almost any feature you desire, including contact forms, social media integration, or a blog or forum. Of course, using any new software can be intimidating but even if you’re a complete beginner, with WordPress the admin dashboard is simple to navigate and understand. No matter whether you’re customizing settings, writing content, or installing themes and plugins, you don’t need any coding knowledge in order to design and create a functional and aesthetically pleasing site. WordPress core is also designed with security in mind, so it will help protect your information and content. Additionally, WordPress frequently and regularly releases security updates to address any issues or concerns and there are also security plugins you can utilize to make your site even safer. When you make the decision to build your company website, of course your overall goal is to get as many people to visit as possible — and WordPress makes this simple. One of the best ways to do this is to practice effective SEO, which simply means ‘tweaking’ your website so that search engines like Google can easily find and display it on relevant search engine result pages (SERPS). Just as they do with security, WordPress is well-optimized for search engines right from the outset. WordPress covers both website speed and responsiveness for mobile devices, which are both key to proper SEO and ranking. WordPress eliminates any content bottlenecks, which means that your content will be updated more often, and this helps improve your site’s ranking. By utilizing a plugin like Yoast, you can test your site’s SEO strength or customize the page title and META descriptions. Why is WordPress Better for Digital Marketing? These days, digital marketing requires companies to have a CMS (content management system) that’s easy to use and doesn’t hinder your content or hamper marketing objectives. While the above choices all have their pros and cons, WordPress functionality can be extended to fit most anyone’s website needs and is great for digital marketing for several reasons. This is a proven digital marketing strategy and simply means getting your website content promoted through social media, email, paid channels, and more in order to reach your target audience. Your digital marketing company can utilize targeted phrases and keywords in your content in order to enhance search engine visibility. Since this useful content is also useful and valuable to your audience, this practice also helps build “backlinks,” which are shares and other mentions of your content that links back to your website. Content marketing is inherent in WordPress, it started as a blogging tool and has evolved over the years to make it one of the easiest utilities for creating and editing website content. WordPress has a large variety of plugins available, including an iMIS plugin, that can assist you with managing most of your membership needs. While not a full fledged Association Management System (AMS) like iMIS, you can easily sell merchandise, offer payment and scheduling options for events, manage your members, and much more. You can use WordPress to create a community of brand evangelists, which is great for associations, nonprofits, and small to medium sized businesses. With plugins and a solid digital marketing strategy, you can turn your website into a portal where your members, clients, and customers can gain access to your information. From this hub, a marketing “wheel” can be created where social channels are the spokes and your community shares and discusses the content, merchandise, and events on your website – the hub of the wheel. This is the art of turning site visits into actual leads or sales. With WordPress, you can easily track which content receives visits, shares, or comments, and which do not. From there it is easy to tweak or eliminate any unpopular content and take the opportunity to expand upon the content that is doing well. With WordPress, you can also track which calls to action (CTA) work and which do not, and you can experiment with a variety of offers and calls to action and after identifying any that aren’t working, you can replace it with different content that may provide better results. Your digital marketing partner can utilize callouts and CTAs like buttons and styled boxes and by using a plugin like Advanced Custom Fields, we can set up these options so that they are easily editable should you ever desire changes. We understand that the thought of building your own site can be intimidating, but having professionals design your business website on a platform like WordPress is easier than ever and provides you with numerous benefits. The experts at 51Blocks have the experience and skills in website development and design to understand how to build a website that stands out from the competition while retaining simplicity and ease-of-use for consumers of all computer skill levels. Contact us today to learn more about our web design and website development process.